We had one of those “I want to eat this every night all week 700 times” dinner experiences last week, and now I see this pasta taking over for this week. Sundried tomatoes just make the world a yummier place! Just the word Florentine makes me feel like I won a free trip to Italy!!!!! This is totally what I order when I go out to eat and like, you know finish my whole meal. The waitress/waiter always makes a comment about where my meal went? It’s like, hmmm, what are you really trying to say here? Agreed! It’s pure happy in a tiny little jar! The recipe for chicken florentine pasta calls for 1/2 cup of half and half. Ok I’m just a male but what the …is the half and half? This majorly flopped for me too, Courtney. I don’t think it’s possible for this amount of liquid to thicken on its own. I almost turned this into a bechamel, but unfortunately decided to try the recipe as is. It turned out like pasta soup with globs of cheese. Sadly, a wasted amount of food. where can i buy the cherry sun dried tomatoes? i live in napa california, i went to raleys yesterday and didn’t find it so i just went and bought the julienenned cut sun dried tomatoes in an olive oil jar? will this work? This sounds like the right thing to have for dinner tonight. You are so right! Love me some healthy dishes (aka noodles made from vegetables) buuuut also love/need actual pasta meals sometimes! This looks delicious. Yep – gotta do it! Simple comforting and creamy pasta is the way to go sometimes. 🙂 I love everything about this pasta, yum! This makes me want to scratch the menu plan I had for the week and make this ASAP! Delicious sounding recipe and beautiful pictures! Love quick and easy recipes! This pasta looks delicious. Ugh, you made me so hungry for pasta just now and i just barely finished breakfast! These sun dried tomatoes look amazing, the whole dish is mouthwatering! That is yummy, no doubts ! Sun dried tomatoes are the best! I like to think of them outside sunbathing until they are perfectly toasted. : ) Makes me want to learn how to do my own! With dishes like this do you ever think of opening a restaurant? If so, please add me to the reservation list. You’re funny 🙂 Too much work to own a restaurant, I think! I’ll stick with cooking for two and the occasional dinner party. I love veggie noodles as much as the next gal, but Pasta is still a thing. This one looks positively delicious. 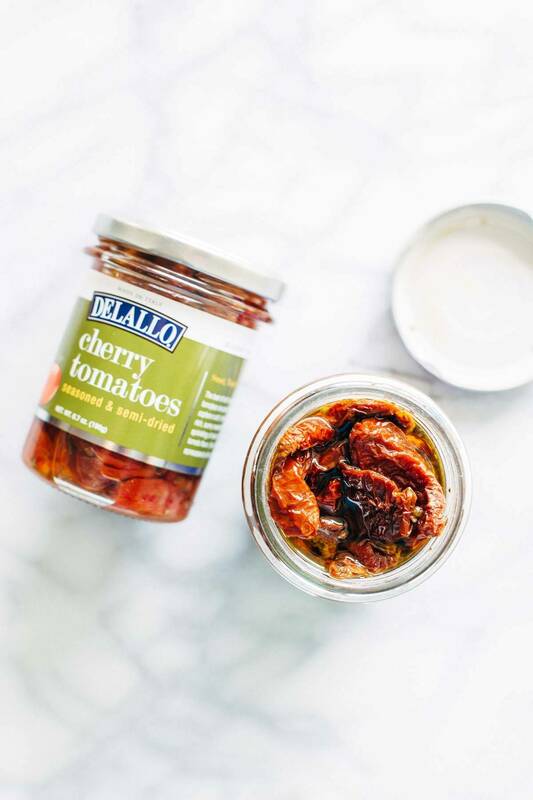 It’s also a great excuse for me to grab a jar of sun dried tomatoes- yum! Can’t wait to give this a whirl! Thanks Sydney! Hope you like it! Your pasta game is on point these days!! This creamy pasta is KILLER! Yum!! Yep, as great as zucchini and sweet potato noodles can be, sometimes you just need to go for some REAL pasta. I love sun dried tomatoes and totally agree that packed in oil is the way to go. I’m going to look for their jarred cherry tomatoes now, too! I used to fear the oil-packed ones for all the added oil, but ugh, now I can’t handle the dry ones! Have to have to have to get them packed in oil! This looks delish! Just one question. Do we leave the cooked chicken in the pan as we are building the sauce? Yes, good question. That’s how I did it! This sounds wonderful and your photos just make me want to do a swan dive right into all the luscious goodness. 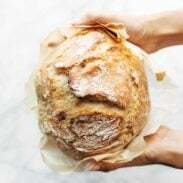 Great recipe thank you for sharing! This sounds really yummy! Have you ever tried using rotisserie chicken in place of the raw chicken that you cut up and cook for your recipes? I just buy a Costco chicken, take all the meat off the bone (a little time consuming, but worth it), and put it in 2 cup Ziploc bags in the freezer for when I make a recipe that includes chicken. I usually get 6 or 7 cups from one chicken. It is already seasoned to deliciousness and tastes waaaaay better than some chunks of chicken breast. 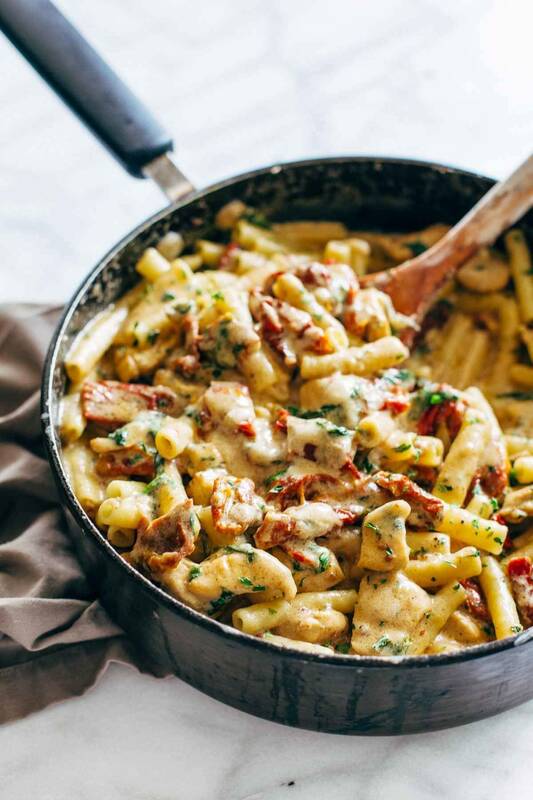 Can’t wait to try this Sundried Tomato Chicken Florentine Pasta!! No but I love that idea. I just can’t handle the chicken sometimes… but love the flavor and moisture in rotisserie chicken! GAH!!! I get you! Pasta, the end. This one is getting made soon in our house! Yum!! Thanks Malia! hope you like it! I love your Truths today! I sometimes can’t handle chicken either, but the hubs loves meat so I just gulp it down. 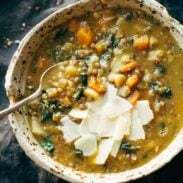 It is stormy here and a warm, comforting meal sounds divine. I might just have to make this tonight! Do it! 🙂 Glad to have a fellow chicken rejecter in the group. Yes! Swoodles. I can’t get enough. Those tomatoes look heavenly! Love this dish. 🙂 I don’t know about the rest of you guys, but I am always more hungry on Mondays. I agree Brittany: Mondays require REAL carbs!! Exactly. REAL pasta for the win! What’s the all purpose seasoning mix? Could be anything – salt and pepper, a chicken seasoning mix, I like to use Emeril’s Essence sometimes… I usually just grab something that is a pretty generic spice mix from my cabinet and sprinkle it on to give the chicken a little extra flavor. When in doubt, I find that Emeril’s is a good all purpose seasoning mix. This recipe does sound yummy. I just tried drying my own tomatoes in my dehydrator, so I would try those before buying others. I used ones that are supposed to be very flavorful. I would leave the chicken in just because I need the protein. But I hear you about not liking chicken. I am in the process of reading a book called “The Dorito Effect”, which talks about flavor and what has been done to our food supply. I’ve been around long enough that I can tell you that today’s chicken does not look or taste like the chicken I ate when I was growing up and through my early adult years. Reading that book will help you to understand why it is you don’t like things like today’s chicken. What a fun idea with the dehydrator Susan! I’ve never tried that! I was wondering why you couldn’t try cooking the chicken in a bit of the oil that the tomatoes were in to add some flavor…and like Susan mentioned in the post above, chicken does NOT taste like it used to. Too much processing in the food supply. You definitely could! I found that the tomato oil didn’t have a ton of flavor – I mean, it had some Italian flavor from being packed with the Italian herbs and stuff, but I still felt like it needed some extra seasoning or spice or something. Mmmm…I need to make this soon!! We are a big pasta-loving family!! 🙂 Pinned! !